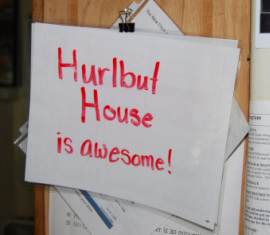 A kitchen and dining room remodel worthy of any HGTV show is on its final stretch at the Hurlbut House as in-house general contractors, Felix and Tim, put the finishing touches on new cabinets, countertops, windows, doors and flooring. Resilient DuraTru plank flooring has replaced the dated thin vinyl while granite slab countertops and hardwood cabinets adorn the now much more open kitchen and food prep area. Larger double-paned vinyl framed windows, modified door jams and the removal of a common wall allow for much more natural light and open space for the group home housing the youngest clients of Greenacres. A special thank you goes to Aura and her guys for their patience and assistance during this major transformation.....the Hurlbut House IS Awesome!